New Delhi [India], Dec 7 (ANI): Ace director Karan Johar is all set to sip coffee with the Kapoor siblings- Sonam, Rhea and Harshvardhan- on his popular talk show 'Koffee with Karan'. 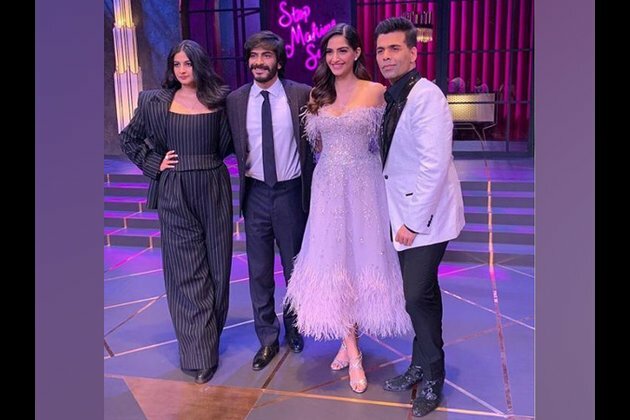 Harshvardhan took to Instagram to share a still from the sets of the show, captioned "Get excited @sonamkapoor @rheakapoor @karanjohar koffewithkaran coming soon." In the still, Sonam can be seen sporting a lavender off-shoulder dress and matching heels, while her sister Rhea looks stunning in a striped pantsuit and matching blazer.The men, on the other hand, look dapper in three-piece suits as they pose for the snap. The first episode of the sixth season of 'Koffee with Karan' saw Bollywood's leading ladies Deepika Padukone and Alia Bhatt gracing the couch.